So I have researched what other color picker controls do and decided to write the one myself that I would base on Microsoft AJAX .NET platform. After some considerations I've decided to go even further and build an AJAX Control Toolkit Extender control. As an example I took an AJAX Control Toolkit Calendar extender and in my Color Picker extender control I also internally used another AJAX Control Toolkit control: Popup extender. So what are the advantages of implementing a client control as an ASP.NET AJAX extender? You use ASP.NET page mark-up to render the control content to the browser. So I have spent a few days coding the control and finally it's out there. I have created a Codeplex project for it so if you are interested just go there and download the control and a Demo Web site. Second, it's extremely easy to use. The extender attaches to an ASP.NET TextBox server control and to an optional button that can open a popup window and an element that samples a selected color in the background. User selects a color by clicking on a colored area. Below is a code example of using an extender on an ASP.NET page. Feel free to download the extender from the Codeplex, try it and post any comments or suggestions on the Codeplex project page. If you ever wanted to set a color for a custom VEShape object of type polyline or polygon than you must be familiar with the VEColor class that is used to represent a color in VirtualEarth SDK. 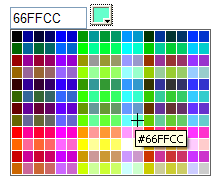 I am sure there are reasons behind of the design of the VEColor class, but for those who are used to a standard Web color representation in a form of 6-digit hexadecimal number it's kind of weird to provide 3 integer number in order to construct a color. So I was in a search for some convenient ways of converting between VEColor and standard Web color and first place I looked through was of course the VirtualEarth Map control because I thought that the VE developers themselves would need a way to perform the same exercise. No surprise there is a couple of non-documented VE objects to support such conversion technique. Both objects are available on the page after you reference a VE Map control v6.1. Of course there is no guarantee of any support of those objects in any future versions of the VE Map control so use it at your own risk and have fun.